The result can be coded projects intended to be read by people and not just machines, improving both execution and long-term maintenance. Third, work flow data reporting is rationalized for improved effectiveness using RMarkdown. 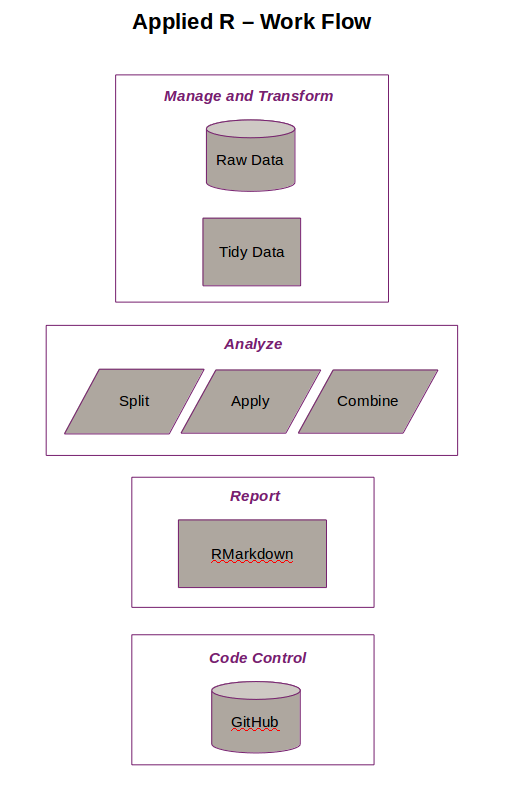 RMarkdown documents, for example, are fully reproducible data analysis tools that combine text narration with embedded data and source code. 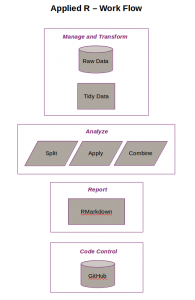 Publication quality documents are easily achieved using RMarkdown and simple templates. In fact, RMarkdown supports 50 document output formats including Word, PDF and HTML documents to name just a few. Finally, the work flow embraces the use of Git and GitHub. Git is local software for version control. Github is an online storage archive with project management tools. Together, Git and GitHub are ideal solutions for warehousing project data, source code and documents.